January has come and gone, and boy was there a lot going on here for the Crook County FFA Chapter. With the way the calendar fell this year, January was a very short school month, which meant a very short amount of time to really prepare for a number of events. Even with the reduced amount of time that members and I were able to work to prepare for the events we had, we were still able to get things done and experience several successes. The Central Oregon District FFA hosted its first annual leadership convention in Redmond on Jan. 28 and 29. Chapters worked for the months leading up to this event, preparing to compete in a number of activities that we normally spread throughout the month of February. Chapters from North Lake, Bend, Redmond, Crook County, Culver, Madras, Sherman County and Dufur came together to conduct business and compete against each other in a wide variety of leadership development and chapter books events. Members competed in a test of their knowledge of agricultural cooperatives as well as their job interviewing skills. Teams competed in parliamentary procedure and a variety of public speaking events. Chapters entered their secretary's and treasurer's books, as well as their chapter scrapbooks for evaluation. Members from the district also applied for and interviewed to determine who would represent the district at the state convention in various proficiency award areas. Lastly, members that have qualified for the State FFA Degree presented to members of the various communities to confirm their degrees. Crook County FFA participated in the above event and had many successes. The team of Abby McNary, Raquel Middaugh, Lauren Papke, Daisy Forseth, Mason Calhoun and Bailey Everest competed in the Advanced Parliamentary Procedure contest, placing fourth. Abby McNary placed third in the Creed Speaking Contest. Daisy Forseth competed in the Job Interview and Co-op Quiz events. Daisy and Raquel Middaugh participated in the Advanced Portfolio portion of the Chapter Books contest, placing first and second respectively. Daisy will be taking her portfolio as the district representative to the state convention over spring break. In addition to this, the chapter entered all three of the chapter books (secretary, treasurer and scrapbook) for evaluation. The secretary book placed second and will move onto state. The treasurer's book placed fourth, and the scrapbook placed third. Overall, Crook County earned third place in the Chapter Books event. 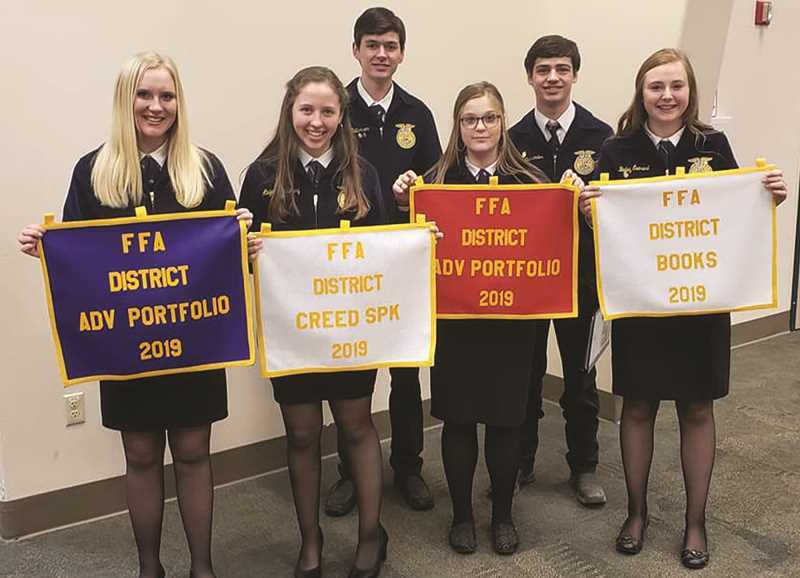 We also had a number of members apply for district proficiency awards and the right to represent the district at the State Convention in March. Our district recognizes proficiency in the different project areas that students maintain throughout the year. Proficiency awards are ranked gold, silver or bronze based on the years of records in the project area, quality of the candidate's application and interview. Daisy Forseth – Sheep production, gold winner and moves onto state. Cade Catterson – Swine production, gold winner and moves onto state. Cade Ostrander – Forage production, gold winner and moves onto state. Cade Ostrander – Diversified ag production, gold winner and moves onto state. In addition to these proficiency awards, Cade Ostrander was selected as the district representative for the Start in Agricultural Placement contest at the State Convention. Cade will compete against other members from the 12 FFA districts in Oregon for a chance to represent our state at the national convention next fall. Lastly, but certainly not in the least, two of our members successfully presented their defense of why they should earn and receive the Oregon FFA State Degree. Both Raquel Middaugh and Cade Catterson earned their State Degree and will receive them at the State Convention in March over spring break. It was a busy month getting ready for all of this, and we have a lot to continue to prepare for as we work to competing at our best at the state convention. We also have a few other events coming up in February that are very important. The most significant is our Donkey Basketball Tournament coming up on Saturday, Feb. 9. The event will be held at the CCHS gym beginning at 5:30 with a taco feed. We will begin games at 6 p.m., and are hoping for a packed gym. Tickets will be available at the door for the games for $11 for adults and $8 for students. Tacos will be $2 and includes drinks. The money raised will help support the chapter as we move forward to the state convention and make early plans for attending the national convention. Teams from the CCFFA, Bend FFA, Les Schwab, Ochoco Irrigation District, Crook County High School and the Prineville Police Department will all be participating in the tournament. Come out and have a great time while supporting a great group of student FFA members!